This Leprechaun Bait is guaranteed to catch even the most mischievous leprechaun. There is no way they can resist this stuff! It is crazy good! And slightly addictive. This is a great treat for classmates, neighbors or co-workers for St. Patrick's Day. Put some in a cellophane bag and tie it up with some green ribbon. Easy and festive! This mix uses all the marshmallow from a box of Lucky Charms and only 3 cups of the Lucky Charms cereal. I threw away the rest of the cereal. In my opinion, Lucky Charms isn’t worth eating without the marshmallows. 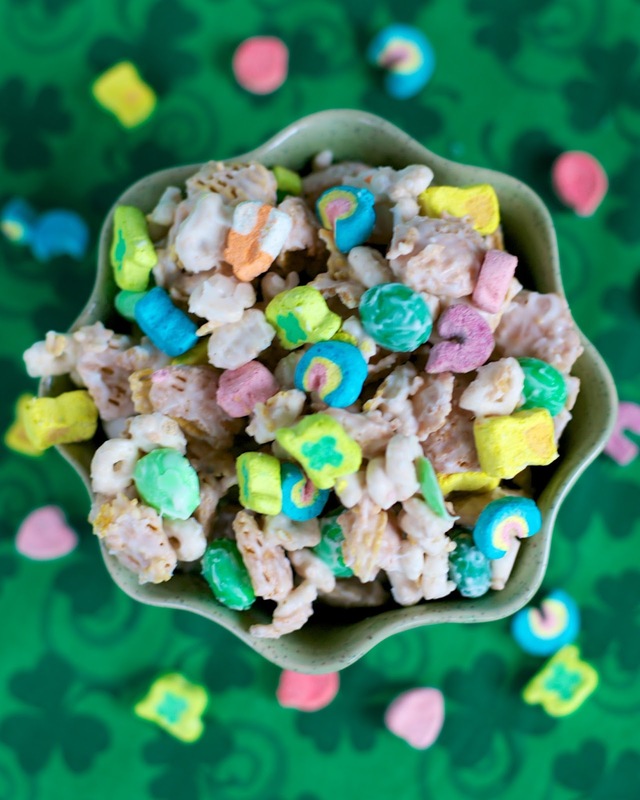 Why don’t they make Lucky Charm Marshmallow only “cereal”? Capt’n Crunch makes Oops! All Berries - how about OOPS! All Marshmallows! You know you would buy it! I certainly would! 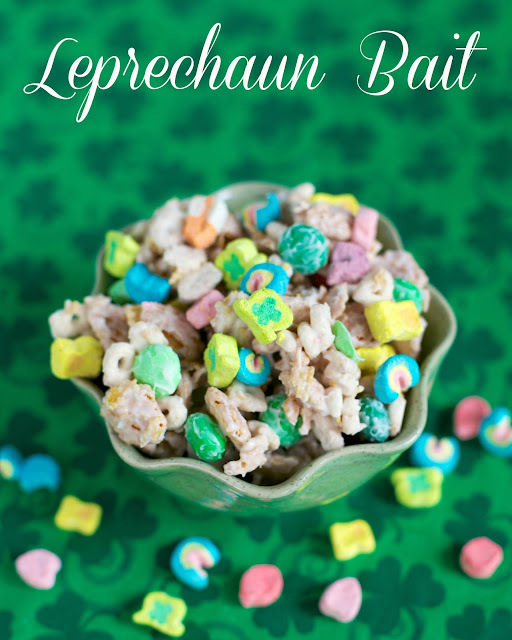 Pour Lucky Charms into a large bowl. Separate marshmallows from cereal. Reserve 3 cups of cereal for bait. In a large bowl combine Crispix, 3 cups of Lucky Charms and M&Ms. Melt almond bark according to package directions. Pour over cereal mixture. Toss to combine. Sprinkle with marshmallows. Pour mixture onto wax paper or parchment. Allow to set and break up into pieces. I love snacks like this! Can't wait to make it for the kiddos. Guess what, you CAN have just the marshmallows! Check out: http://www.thekitchn.com/yes-they-do-exist-cereal-marsh-152977 Enjoy, and War Eagle! Re: the marshmallows are at a fun site called nuts.com. Also swear I saw them at the grocery store (King Soopers, which is a Kroger store) in tiny little cello bags in - maybe - the baking section.